Hello, and welcome to Terper's (that's me!) 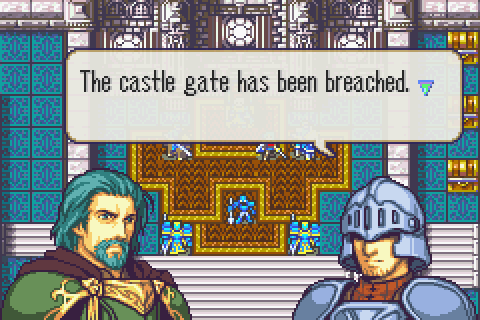 Fire Emblem: The Sacred Stones Rewrite Project. The name's a placeholder until I can think of a catchy, melodramatic title. Just call it "Rewrite" for short or whatever you'd like. 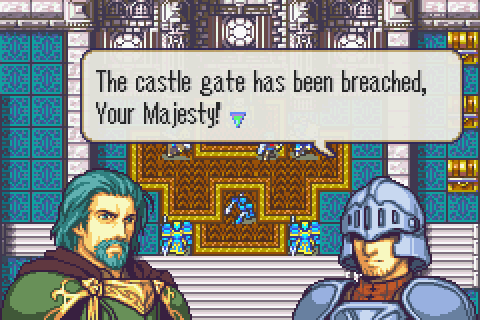 The Sacred Stones is a pretty cool game. It's got monsters and dragons and swords and sorcery and branching promotions which is like, whoa. But I also think the plot is sort of undercooked. Our two main leads are fairly static characters who do not really grow or change. 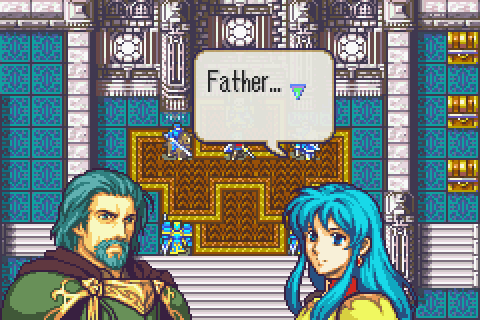 Immediately after her castle is taken, Princess Eirika gives a short speech about how she must not give in to despair, and proceeds to not give in to despair. And that's fine, I guess, but I want to see her deal with the events taking place around her in a more interesting way. I want to see her come to terms with her place in this conflict and grow as a person! And from that budding desire to change a few things about our main characters eventually grew this beautiful* need to change how pretty much the entire plot plays out. Fascinating. But that is, of course, only working with what is already there, just changing and adding a few words here and there, adding a little bit of emotion. That's boring. This is not a relocalization. By which I mean this is a rewrite. The story and the characters WILL differ from the original author's intent and I apologize if I change things in ways you don't like. I'm sorry. This means that if you encounter any discrepancies between how characters exist in this hack and how they are in the Original/Heroes/Cipher/Japanese Original, well then there should be a reason for it. Hopefully a decently good one. At times I might have rewritten a perfectly fine line for no good reason just because the mood struck me. As of the time that this thread goes up, I have rewritten everything between the Prologue up until the Route Split (spoilers: There will be no route split. A) Because I'm lazy and B) Because it limits the characters' development if our two leads can't be together and interact and talk and grow). I have not rewritten Supports yet. I'm going to. If there are only a few minor issues in this current patch, then I will not update the patch until I am done with Chapter 16. After that will be the final major update with the rest of the story, and then a couple of eventual bug fixes and quality assurance stuff after that. If anyone in your party dies, it's game over. Let me repeat that: If Anyone Dies, It's Game Over. This includes enemy units that you can recruit. Killing Joshua in Chapter 5 will cause a Time Paradox. Keep your save states ready. Or the reset button. I'm sorry if you love to Ironman. The story will assume that you have recruited everyone. Please do not go around Joshua and "forget" to recruit him in an attempt to spite me just because I won't let you kill him. Not only would that be very rude, he will still show up in the story, and you will only have yourself to blame for this. Shame on you. You can't play on Easy because I'm using some of those tutorial prompts for new scenes. I have made a few gameplay changes here and there and they are basically untested. Please give feedback on that. Also please give feedback if anything breaks/you encounter some odd glitch. I have never hacked before. This is scary. Some of these gameplay changes are made for story-purposes, some are things I think could be rad. Please also give feedback and share your thoughts on what you think of the story since this is a story-focused hack. I would like that. I try to be woke, so if you find anything unwoke, then please bring it to my attention. English is not my first language and though I think I'm pretty good at it, if you encounter anything weird, well then that's why. If you find any typos or weird sentences, do mention them. If this interests you, then rev up your favorite UPS patcher and apply THIS PATCH to your rom. If you don't know how to do this, just google "UPS Patcher". I believe in you. Due to story reasons, changes have been made to who joins the party when. Weapon Triangle (Dis)Advantage is no longer +/-15 Hit, +/-1 Attack, but +/-20 Hit and +/-2 Attack. Eirika's growths has been slightly buffed (Str and Res) to make her a bit more fun to use. Seth has taken a few hits all across his growths because yikes that man is strong. Seth now starts with only a Steel Lance. Seth now starts the first two maps with 10 HP. The chests in Chapter 3 are way boring in the original, so I added the monster-killing Iron weapons to them. Changes in enemy composition and/or numbers have been made to chapters 4, 5x, 7, and 8. Mostly for story reasons. Due to missing out on experience in the changes made to chapter 5x, Ephraim, Forde and Kyle all join with increased levels, and Kyle specifically has received some boosts to his base stats. Because they see next to no combat in this version, this has not been balanced at all. Every single thing in here is subject to change at my whimsy. I, for one, welcome my new Terp-writing overlord. 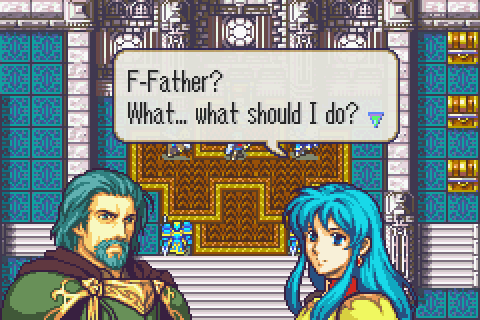 I've played through to the route split, as someone who adamantly thinks FE8 has some of the worst main characters in the series, everything he's done has been welcome changes. Gay space dragon that plays Fire Emblem for some reason. Is it okay if I post a playthrough on YouTube? Of course! That'd be pretty "dope", as we say in the business. Please do not go around Joshua and "forget" to recruit him in an attempt to spite me just because I won't let you kill him. Not only would that be very rude, he will still show up in the story, and you will only have yourself to blame for this. I was always a fan of the gameplay in FE8, but the story and characters were always lackluster to me. So this is pretty interesting to me, I'll give it a go. Yes, that is an idea that I had while editing Chapter 8. At the moment it is not something I am going to focus on or add to the current patch, but I will have a more serious think about it later on. Thanks for the feedback! I don't feel I have done enough gameplay-related changes n the current version to justify sharing a document because it wouldn't really have much interesting things in it, but as work on the project continues and we approach mid-endgame, significant gameplay changes will have to be made and a document will become more necessary to detail everything. That said, I will add most of the major changes in the current patch to the bottom of the OP. Inventing some Heroes Banners, maybe. FE8 is probably my 3rd favourite game in the franchise (only behind Echoes and Blazing Sword), so a rewrite to make things even more interesting would be freaking great. Seems interesting. I've actually just finished replaying Sacred Stones recently and in the middle of playing Elibean Nights atm, but I'll be sure to try this afterward. I hope it will live up to your expectations, TheZakkAttack! And the reason some supports will have to be rewritten, Tranquillo, is because some of them will conflict with how the story and characters will play out. Easy example: In the original, Tana joins the party without Hayden's permission, but in this rewrite, she has it. This means Tana's and Eirika's support will have to be changed, as Eirika says that the two need to apologize to Hayden later (In the rewrite, this will be replaced with a confession of love, as I am adding gay pairings). Red Pandas are absolutely adorable! (In the rewrite, this will be replaced with a confession of love, as I am adding gay pairings). Joking aside, I'm excited for this rewrite. 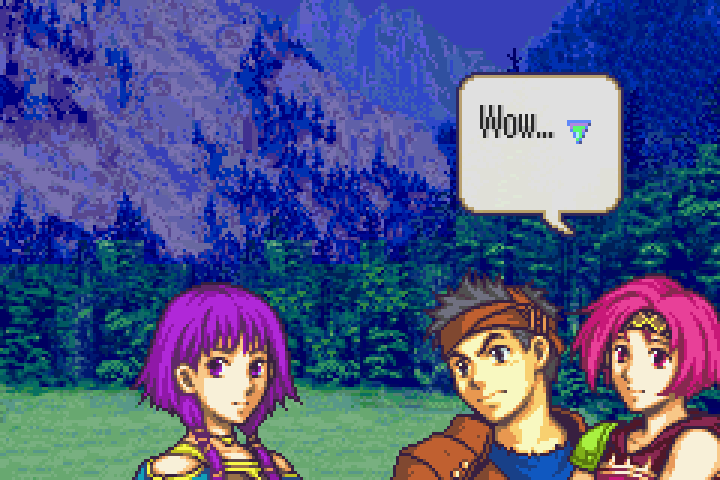 FE8 is one of my favorite Fire Emblems, so to see it rewritten like this is amazing! I can't wait to see how this turns out! Out of curiosity, what new gay pairings could we expect to see? Well, I have not really planned out or written any new supports or how to change them yet, and I won't until I have actually written out the entire story's script from beginning to end (since I won't know exactly all the ways the sidecast will interact or impact the game's story until everything is said and done - the broad strokes of the story and its themes and how I want to reach them are done, but all of the writing itself happens very spontaneously). 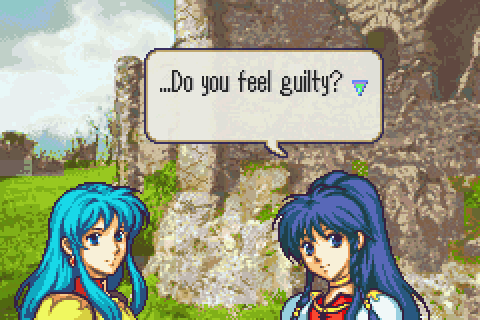 Eirika and Tana is an obvious pairing - they interact a lot more in the main story now, and the strong connection between them lends itself well to romance. However, as I write out the story, new connections are formed between the characters that I didn't actually plan out nor did they exist in the original. For example, because of a scene late in the current patch (that I originally didn't plan out at all and was only added because I felt that something was "missing"), I really want to add a support conversation between Eirika and Neimi. I don't think this will be a romantic pairing, but the two form a connection during the main story that I want to explore. But I also haven't decided that it WON'T be gay, so if some huge EirikaxNeimi shipper has dreamed of something like this for years then who am I to refuse them? As I begin writing the second act, and Ephraim becomes a more prominent character, he too will begin forming emotional connections to the rest of the (male) cast. One support I have planned to add for him, and which will be romantic, will be one with Joshua, who will be an important factor in Ephraim's development (Joshua will also take a more prominent role in the story starting from chapter 9). The same is also true of Saleh (though he won't be AS important). And then there will of course be pairings disconnected from our two leads. Forde and Kyle. Garcia and Gilliam. Tana and Marisa. And more. This entire thing you're doing sounds great I'll be trying it out myself sometime soon. Probably the only feedback I can give for now is, if you do have time for it maybe give personal skills to the characters on the gameplay aspect otherwise this would be a good replay of FE8 again. Skills are something I have considered, since they're so easy to implement nowadays, but I do want to try and avoid feature bloat. 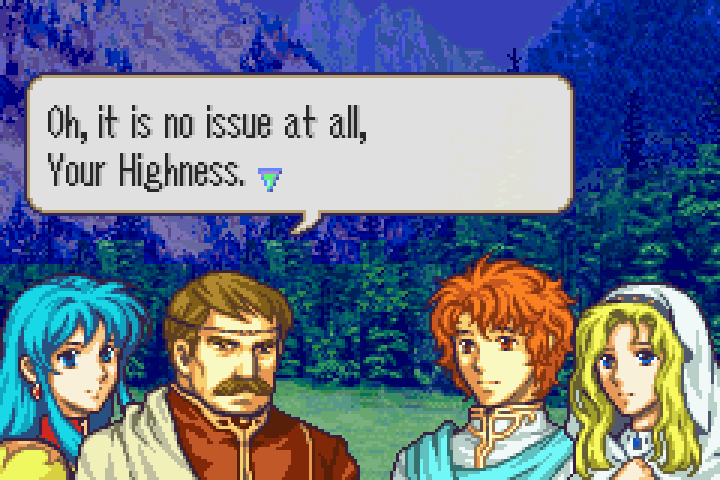 I want the experience to still be recognizably FE8, and I don't want the player to have to consistently check "wait what can my units do now again?" If I do implement skills, then they would probably only appear on important bosses, like giving Sol to Caellach for example. Enough to turn them into slightly more meaty, memorable encounters (in addition to the story making them hopefully slightly more meaty, memorable encounters). Soooooo, that means there will be possible male/male pairings?! "Prays for Artur/Cormag or Artur/Joshua"
Very cool! However, make sure not to shaft straight and, most importantly, Non-Romantic supports. Because people can talk to each other without trying to get into each other's pants. Yeah gotta agree with this, and if being taken into account, how would it work? I think the support limit is only 3 max (A,B,C) no S rank support like in awakening that determined a pair. So for instance the Joshua and Ephraim thing you mentioned, that A rank support is what makes them into a pair right? Or is there some way to still keep things platonic but still keep the A rank bonus and all that. As I said, the Eirika and Neimi support is a new one that is not one I will necessarily be making romantic. And none of the new support pairings are made with the point of writing or not writing romance, or because I do or don't want teh gay. 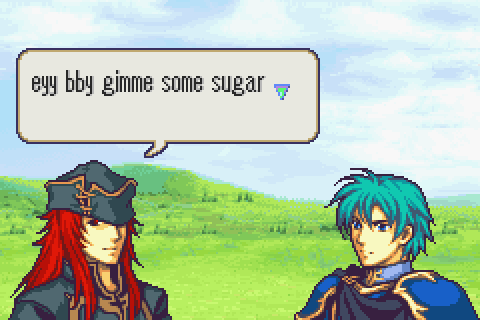 I want to write a Joshua and Ephraim support because they are very similar characters who go through very similar things and can talk about those things and realize new things about themselves that way (for example, Ephraim realizes he'd really like to see Joshua's 'Audhulma'). 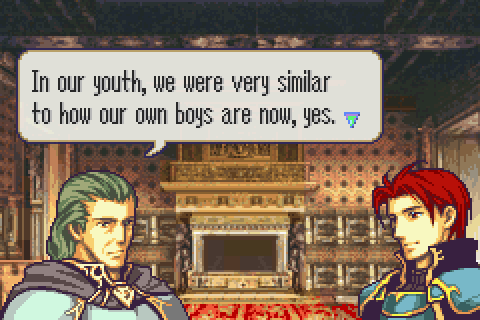 The Ephraim and Saleh support will exist because Ephraim, in the base game, is far too "cool" a character. The focus is not "hey they should bang", but "hey Ephraim needs a support in which he can be goofy and lighthearted in a charming way". And no I will not introduce any S-ranks or anything.